3 - 3,4,5..........Bingo von Ellendonk. 3 - 3,4,5..........Cona von Niederkassel. 1998: 16-95-93 = 204 points (30th). 29/11/1997: 100-88-96 = 284 points. Doberwache's Amatzon was a qualified SEK (SWAT & trained anti-terrorist dog) Polizeidiensthund, competed in the D.V. Meisterschaft and passed the ZTP with 1A rating for character and SG for conformation in 1995. He lived to 9 years of age and DNA tested clear for vWD (VetGen). Amatzon's sire, Papin Amatzon, was the winner of the all breeds Finnish IPO Championship in 1992 and his dam, Kleo von der Weyermühle, was a German Policedog who also won the working IDC World Championship in 1996. 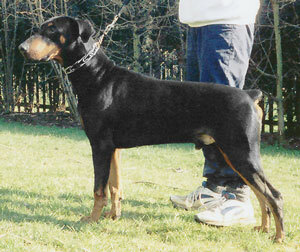 Kleo is also dam of the von der Doberwache “B, C” litters (Bronco, Bastian, Bingo, Brista, Branca, Biene, Chico). Chico: SchH 3, DV-DM participant. Curd: SchH 3, FH, DV-DM participant and passed the Körung 'for life' with highest rating for hardness, courage and working drives. He is sire of the von der Burgstätte “C” litter (Calle, Carla). Cleo: IPO 2 and passed the ZTP with 1B rating for character. She is dam of the vom Burgwald “N, P, S” litters (Nira, Pedro, Pila). Gini: SchH 2 and ZTP with 1A rating for character and SG for conformation. She is dam of the vom Dragonerreich “E” litter (Evita). Jonas: SchH 3, D.V. Vice-Leistungssieger in 2000 and passed the ZTP with 1A rating for character and SG for conformation. Snoopy: SchH 3 and dam of Ascomannis “F, H” litters (Freya, Fenya, Hella) and Germania “B, D” litter (Bingo, Dubheasa).